My thanks to Emma Welton and Bloodhound Books for the invite and the ARC. First let’s find out a bit about Mr Smith and this book! 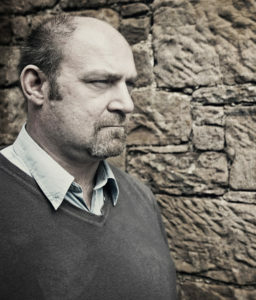 He is an internationally best-selling Kindle author and has six books featuring DI Harry Evans and the Cumbrian Major Crimes Team, and four novels, featuring Utah doorman, Jake Boulder. He has a new series, featuring DC Beth Young coming out on November 30th and published by Bookouture. 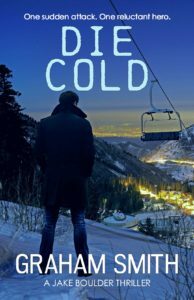 Jake Boulder is working as a bartender, at an exclusive Vermont ski resort on New Year’s Eve, when armed terrorists hold up the lodge and take all the customers and guests hostage. BOOM! 💥BOOM!💥 BOOM!💥 Jake Boulder is back and I couldn’t be happier! Set in a Vermont ski resort on New Years Eve, the reader is faced with escaping the past, protection, moving forward /new beginnings, change, greed, guilt, blame, survival, and justice to name but a few of the things you will come across in another explosive action thriller from the fabulous Graham Smith! 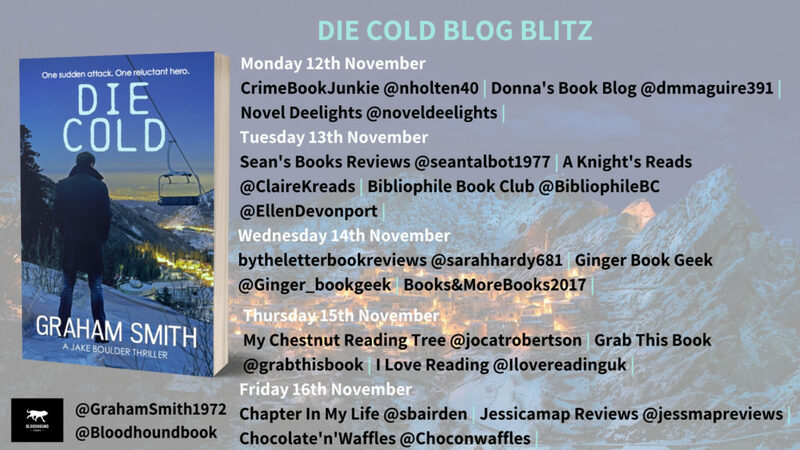 Although I still haven’t forgiven the author for the emotional torment that was delivered in Past Echoes, the absolute adrenaline rush I got from reading Die Cold soon made up for it all. As always, the reader is immediately pulled in by Mr Smith’s amazing ability to deliver a #killerhook that has you desperate to read on. Various POV’s gives the reader the full picture of what is happening and the narrative / characterisation shows once again how talented Mr Smith is at providing the reader with interesting, diverse, and relatable characters. The plot has us going through highs and lows – perfectly paced to allow the reader to catch their breath before the next punch-in-the-gut moment occurs. I think it is safe to say that Mr Smith is a DIE HARD fan as the inference is woven throughout the pages wonderfully! Now for my favourite part – CHARACTERS! *Swoon* – oh yeah! Jake Boulder is one of my favourite characters – he’s a deductive thinker and I love the way the reader gets to ‘see’ Boulder assess and dissect a situation to come to a resolution. After the absolute DEVASTATION in Past Echoes (have I mentioned I am STILL not over this! – no spoilers) Jake just wants to find himself again – but as always, trouble has a way of finding him even when he is trying to avoid it. Will Jake ever be able to forgive himself? Will we see our hero find peace and move on? Well you’ll have to read DIE COLD to find out! Sharon Bairden – well where did this kickass, Glasgow lass come from?! (and don’t say Glasgow 🤣) I love this character – a heart of gold but fierce when required, she helps Boulder in his mission to take down the terrorists. Poor, Poor Nathan! Wrong place and wrong time – he may not be as relevant as our other characters in the grand scheme of things, but he served to move the story along in all the right places. I was always keen to see him appear! ‘Hannah’ and the terrorists – Sounds like a rock band, right? But nowhere near as entertaining in their delivery – this group is brutal, ruthless, greedy, power-thirsty, evil, narcissistic mofo’s who will do whatever it takes to get what they want. Will Jake be able to outfox them? And don’t worry- Jake Boulder fans will be pleased to see that Ivy, Alfonse and another favourite- Dr Edwards (can I get a woohoo!) make an appearance as well! I love the Dr and hope we get to see more of him again in future Boulder books. Jake needs him and despite the Dr’s views on the outcome of what happened in Past Echoes, I think the Dr likes the challenge of working with Jake and may even get something out of it too. One final character I want to mention is Daniel Prior. Clever, wise beyond his young years, protective and oh-so-observant – he added a wonderful flavour to the story in his desire to aid Jake in protecting those he was held captive with. Almost like the go between for Jake and Sharon, his bravery was second to none. Fabulous! Soooo, would I recommend this read? Well, you know I am going to say it ….It’s a Yippe-Ki-Yay M***********-ing Hell Yeah from me! A stealth game of cat & mouse, heart-racing, captivating and oh-so-action packed read, you need to add this #badboy to your TBR! Follow the tour and see what everyone else thinks too! 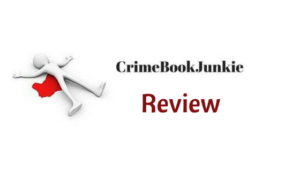 This entry was posted in Blog Tours, Book Reviews and tagged #ActionPacked, #AllTimeFavourite, #BlogTour, #BloodHoundBooks, #Crime, #Crime #Twists #Murder, #CrimeFiction, #CrimeThriller, #GrahamSmith, #Series, #Thriller, #TopRead2018 by crimebookjunkie. Bookmark the permalink.